Imagine what our night sky would look like if its stellar density was a million times greater than it is now. Remarkably, such places actually exist: They’re called “Ultracompact Dwarfs,” and astronomers are calling them an entirely new kind of galaxy. Undergraduate astronomy students Michael Sandoval and Richard Vo from San José University discovered a pair of record-breaking compact galaxies buried within data contained in the Sloan Digital Sky Survey. These exotic objects are similar to ordinary globular clusters, but upwards of a hundred to a thousand times brighter. 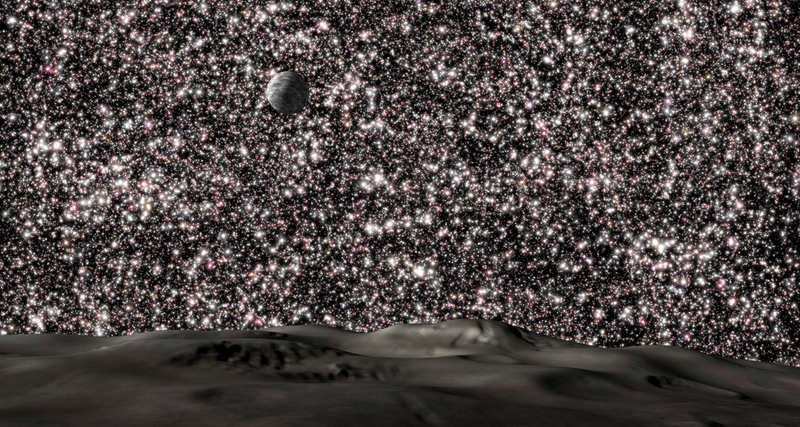 The first system discovered, M59-UCD3, has a width that’s about 200 times smaller than the Milky Way, but with a stellar density 10,000 times greater than what we observe in our immediate galactic neighborhood. The other ultracompact dwarf, called M85-HCC1, is similar in size, but even more impressive; it features a stellar density about a million times greater than what we observe here on Earth. “This hypercompact cluster is by far the densest confirmed free-floating stellar system, and is equivalent to the densest known nuclear star clusters,” write the researchers in their study, which now appears at the Astrophysical Journal Letters. Needless to say, stars within UCDs are packed close together. Like, really close together. “The typical distance between the stars in M59-UCD3 is one-quarter of a light year (20 times less than in the Earth’s vicinity), and in M85-HCC1 is 1/20th of a light year (100 times less). That’s close enough that any ‘Oort Cloud’ of comets would be disrupted,” co-author Aaron Romanowsky told io9. In addition to the Sloan data, the researchers confirmed their observations with the Subaru Telescope, Hubble Space Telescope, and spectroscopy from the Goodman Spectrograph located on the Southern Astrophysical Research Telescope. Exactly how the UCDs formed remains a mystery. There are three going theories: they could be (1) the remnant cores of stripped dwarf galaxies, (2) merged stellar super-clusters, or (3) compact dwarf galaxies that formed within small peaks of primordial dark matter fluctuations. One of the best clues is that some UCDs host overweight supermassive black holes. This suggests that UCDs were originally much bigger galaxies with normal supermassive black holes, whose fluffy outer parts were stripped away, leaving their dense centers behind. This is plausible because the known UCDs are found near massive galaxies that could have done the stripping. What’s more, these stellar objects contain an abundance of heavy elements such as iron. Large galaxies are more efficient at producing these metals, so their high metal content are a potential indication that they used to be much larger. I asked Romanowsky if UCDs might be friendly to life. Read the entire study at the pre-print arXiv: “Hiding in plain sight: record-breaking compact stellar systems in the Sloan Digital Sky Survey”. This study has been accepted for publication at the Astrophysical Journal Letters.